Acle, from the Old English meaning an ‘oak clearing’, is a thriving market town in East Norfolk, close to the Broads and Great Yarmouth. The town has archaeological remains from a variety of periods, and a nationally important complex of World War Two defences. Much of the parish is situated on low-lying land, and was once on the edge of a large estuary, which gradually silted up to become marshland in the early medieval period. There is some evidence of early occupation; prehistoric flint flakes, several Neolithic axeheads (NHER 8593, 10368, 12576, 39314), and a Bronze Age arrowhead (NHER 8595)and a chisel (NHER 39900) have all been found within the parish. Metal detecting has revealed the site of an Iron Age settlement (NHER 40570) near Reepham Road. Large amounts of Iron Age pottery and a spindle whorl were recovered from the site. The discovery of a Roman ring (NHER 24118), Samian ware, and other Roman pottery (NHER 23167, 24118, 30183, 35201, 35995) and coins (NHER 8597, 15474, 17262, 24118, 25023, 35200) suggest that settlement during the Roman period was focused on the higher ground overlooking the estuary, just above the present marshes. Settlement on the higher ground developed from this early period, and in 1086 Acle was a large royal manor, the Domesday Book records fifteen plough teams, a mill, beehives, and woodland. Nothing now remains of Acle Wood (NHER 12202), which was quite substantial; 480 oaks were cut down in one felling in the early 17th century, curiously reminiscent of the ‘oak clearing’ that gave Acle it’s name. During the medieval period, Acle flourished, and was granted permission to hold a market in 1253, and the nearby marshes began to be drained to create large areas of lush pasture. In 1382 the inhabitants of Acle were granted the right of turbary, allowing them to remove turf or peat for fuel, in the park of Acle, which would have been situated on the margins of the parish, in the marshes. Peat digging on a large scale in the medieval period created the Broads, which are the flooded remains of turbaries. Medieval pottery, coins and metalwork, including medieval seal matrices and harness pendants have been found in the parish. 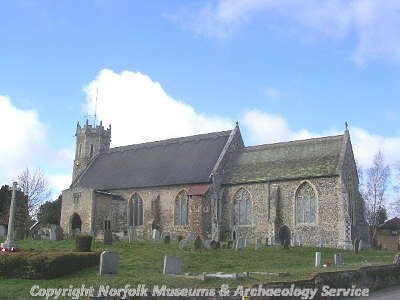 Weybridge Priory (NHER 8601) was founded in the early 12th century, at some distance from the centre of the village, but next to an important ford over the River Bure. The site of the Priory has sometimes been confused with that of the former manor house site in the centre of the village, shown on a map of 1633. The thatched church of St Edmund (NHER 8600) has an unusual and rare handwritten inscription from the 14th century referring to an episode of the plague in Acle, the anonymous writer’s cry of ‘Take note, O gloomy death, how many you are drowning in the depths’ retains its poignancy today. The site of a medieval hermitage is also a reminder of the vibrancy and diversity of pre Reformation religious life. The Bridewell (NHER 12197), a reminder of those who led less devout lives, was mentioned in a letter of 1574, when it was referred to as being newly built. In the late 18th century the prison was in poor repair, with no clean water or straw for the prisoners. An account of life in 15th century Acle by one of its inhabitants, Robert Reynys, refers to a ‘gret dredfull ffyer’ in 1475, which may explain the lack of surviving medieval houses. Most of the older houses date from the 17th century, although some incorporate timbers from earlier buildings, and some have been partially built with medieval stone from the ruins of Weybridge Priory which was dissolved in 1536. During the 18th and 19th centuries, the drainage of the marshes around Acle became more intense with the use of wind pumps and post mills (NHER 8609, 8611, 8612, 15623). 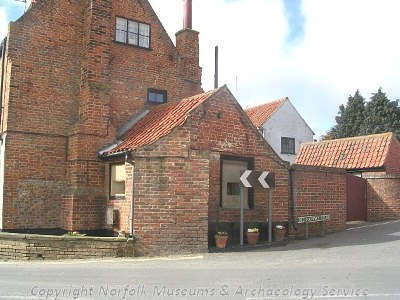 Smithdales Foundry built the last wind pump in Norfolk at Acle, and the company continued to develop more sophisticated drainage technology, some examples of which are in the Gressenhall Farm and Workhouse Museum. 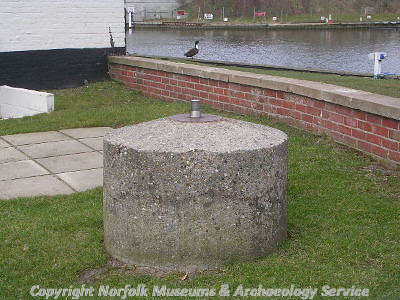 In World War Two Acle was designated a strategic defensive point in the event of a German invasion. The complex series of surviving defences, once part of a much wider network, are of national importance, and include pillboxes, spigot mortar emplacements, weapons pits and tank traps. One pillbox was hidden under the Victoria Jubilee milestone in the village centre, whilst another was disguised as a shed at an important road crossing. Sarah Spooner (NLA), July 2005.